Clapton’s current crop of players continue to make history, this time in the FA Cup, after winning through two rounds for the first time in 14 years against FC Clacton and Norwich United. Two seasons ago, the Tons lifted their first silverware for 27 years with the Gordon Brasted Memorial Trophy win. Last season they won the runners-up shield with the best league finish in 34 years. Now they’ve got the FA Cup in their sights. In fact this season the Tons have won as many FA Cup games as they have in the last decade in total – ‘away’ at London Bari last season and in a replay at Stanway Rovers in 2013. That season was notable, however, for the BT Sports cameras being there for the original Stanway tie at the Old Spotted Dog, which finished 0-0. You can watch that here. It was the most glamorous moment in Tons’ FA Cup history since facing Barnet, in 1990/1, the season the Bees won the Conference title and were promoted to the Football League for the first time. The game was switched to Dagenham’s ground after Barnet chairman Stan Flashman complained that the Old Spotted Dog was unsuitable for a large crowd and the police and football authorities agreed. So it kicked off at the Victoria Ground at noon on a Sunday and ended a creditable 2-0 to Barry Fry’s visitors, who featured several players who went on to decent league careers. You can read a longer report of that game on the Clapton history blog here. In the quarter century since then, perhaps our most notable opponents have been two good Isthmian sides – Braintree Town, a 5-0 defeat away on their march up the leagues, and Hendon, which saw a 3-2 home defeat. Clapton now find themselves in the First Qualifying Round after the 2-0 victory over Norwich United. The last time the Tons reached the Second Qualfying Round was nearly 20 years ago, when Purfleet (now renamed Thurrock) knocked them out. If the Tons were to win their First Qualifying Round game, due to take place on September 2, it’d be only the third time in the club’s history to have won three FA Cup games. The last time that happened was also the last occasion Clapton reached the First Round, in 1957. 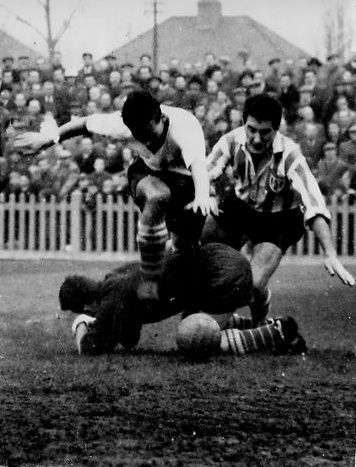 Division 3 South side Queens Park Rangers needed a replay before winning 3-1, despite featuring England goalkeeper Ron Springett. The furthest the club has ever gone in the cup is the Third Round, once, in 1926/7, which also featured a major giant killing. The Tons started in the First Round, knocking out Norwich City of Division 3 South 3-1 at the OSD in front of 4000 fans, despite playing most of the game with ten men. Here’s a longer read on that. They then despatched local rivals Ilford, before losing 3-2 to Swindon Town of Division 3 South in a game switched to West Ham’s Upton Park which attracted an astonishing 27.100 fans. The most famous FA Cup moment involving the Tons, however, came in 1891. Clapton’s 14-0 (FOURTEEN) hammering at Dog against Nottingham Forest is still the heaviest home defeat in FA Cup history.